~ by Chartfag on July 5, 2010.
chartfag has lost its chart and that leaves the fag thing eh? FALL 2010. The season where chartfag died. You’ll be missed. Chartfag is dead, everybody go home. So you’re admitting that you are lazy just like thecartdriver said? Uh, you guys sure will make your own version of the fall season chart, right? They are jupiterstamps from chinkland. I know that the Pokemon Best Wishes is coming out. What I pray isn’t a troll is To Love Ru over there. My god, I really REALLY hope that there’s another To Love Ru series coming. PLEASE. PLEASE LET IT BE TRUE. I can’t read the chart but I’ll wait for yours. Honestly, it really is worth the wait. You always have the best, most concise information on your charts. I always look forward to their release! Good luck and keep up the good work! Sure, it doesn’t sound as wonderful as the fake charts, but it’s still pretty good. That looks legit. All the ones I have on my “to watch” list is on there. @noko Oh! I read that too somewhere, it seems Shaft is going to be great again with Arakawa bridge 2 and kizumonogatari =D. Mirai Nikki (Future Diary) is also getting an anime, but I’m not sure when. I’m hoping as soon as possible! Pilot episode is scheduled for December 2010. Yotsuba& is obviously a fake one (from the fake chartfag one..). The animation team shifts from AIC, to “something” bee then to KyoAni. Well I hope the Birdy one gets a sequel finale.. It’s a cliff hanger. I wanted to see “The Hungry Caterpillar” and “Jojo’s Bizarre Adventure – The Diamond is Unbreakable” become anime. I even made a HC costume to go to my next convention as… joke’s on me. Hey man, the numbers that are really airing are increasing now, don’t you think it’s a good idea to make a fall chart now? I think one of the charts was fake, the other one might have had some false or unconfirmed content but I know some of it was real. Hourou Musuko anime is planned too for Fall. Damn, I want a new Berserk anime… But it was too good to be true. Really thanks again dude ^-^! I am still waiting for Brazilian version trought. It was easy to tell that was fake. For one, what it didn’t list like Toaru Majutsu no Index 2. I mean, whoever did it could have at least looked up ANN for future releases to make it somewhat believable and suckering in people. C’mon, I wanted CHEEEEEEEEEEENNNNNNNNNNNNNNNNNNNNNNNNNNNNNNNNNNNNNNN~ That couldn’t have been fake! Should just let stupid people be stupid. Yeah but I don’t really fancy the “BAAAWWW YOU LIED TO ME” messages that would eventually appear. That wouldn’t be a problem if it weren’t for people using the blog name ._. Someone show that fake chart please. There have been some legit ones, but I guess the difference is that they didn’t claim to be by Chartfag. I just subscribe to this blog’s feed, so if I haven’t seen it before and it claims to be by Chartfag, I know it’s not legit. 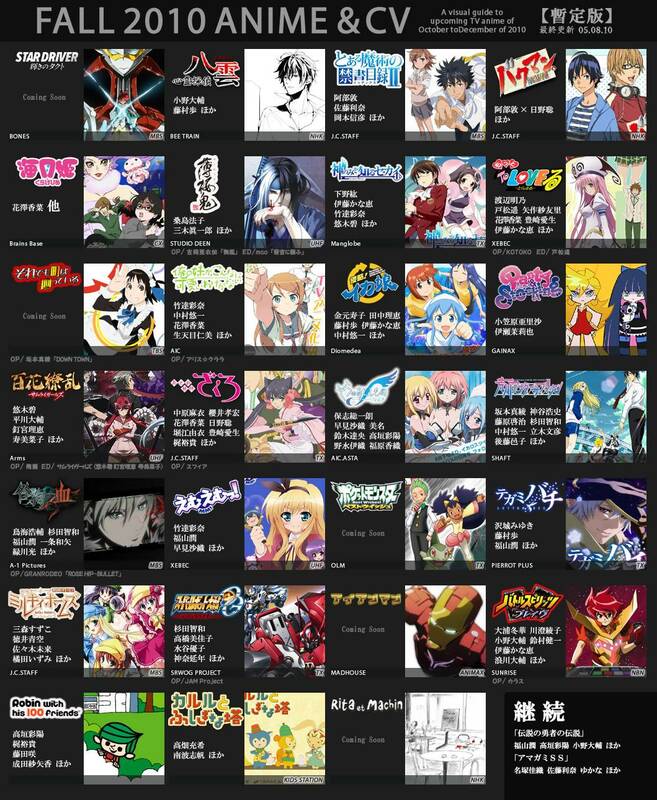 Besides, with any really notable ones, like Baccano season 2, Yotsuba and Franken Fran, it would have been spammed on /a/ for weeks after it got announced, long before someone got the chance to include it on a chart. The people who “fell for it” were probably joking around for the most part. One of those Fall 2010 was absolutely lovely, it’s sad to know we won’t ever get a season as good. It’s really funny how people can actually believe them in the first place. Especially when they have false dates that don’t match up at all (in the future). That chart was an obvious troll.